You have put countless hours into creating, building and maintaining your online business. Now the time has come for you to sell it. Underselling and losing what could be a good deal of money is highly undesirable, but overpricing the business could push away potential buyers. Understanding that your online business is worth only what a buyer is willing to pay for it means taking time to figure out what a fair asking price is. This might seem like a daunting task, but luckily there are a few metrics that can help you determine a proper valuation. What increases your business’ value? What does the average website business sell for? How long will it take to sell your business? When a buyer approaches your business, he/she is basically looking for the rate of return on his/her investment. When will I recover my money? That’s the big question occupying his/her mind at the time. Basically, the buyer will value your business / website based on its sales and profit. What are the sales? What is annual profit, and how long will it take to get my investment back? Before you can begin to calculate the worth of your business, remember that online businesses are different than non-online businesses and include a myriad of business models. Often times, the online business can be simply confused with an e-commerce site, and differentiating between the online businesses, e-commerce businesses and traditional companies becomes important in order to apply proper valuation methods. A traditional company might use a website and have an internet presence, but an online business is, as it sounds, a business that is based online. It has no need of a store-front or other aspects of a traditional businesses. For this, valuation methods for traditional businesses, though useful, are not always applicable to online businesses and can be a waste of your time and money. The wisest option is to see how much internet businesses such as yours are currently selling for. Of course, no single business is identical to any other, and using such reports are only useful as templates. For this, there are services that will analyze your website business specifically to determine what the most accurate value is. Some of these are free while others can cost you several hundred dollars. Optimally, a number of different services should be solicited, and those with the best credentials should be most trusted. Remember that when something is free, there is often a reason for that. The services you may receive without cost are likely to be lesser than those you purchase. So do your research and see what other internet businesses such as yours are currently selling for. Use free valuation services that will analyze your own business to get an idea of what your business might be worth, and then pay the experts to more adequately determine the value of your business. Taken together, this should enable you sell your business at a price that is fair for you and the buyer. Associating your business with the following characteristics will help increase its worth and minimize the risk of failing in years to come. Online businesses’ price tags can range from a few thousand up to billions of dollars. The graph below shows previously analyzed data, which is generally businesses that are in the $100 thousand up to the $10 million valuation range. Looking at the graph, we can see that the average sales is sitting around 2.3 times earnings for the last two years. I believe that there has been more addition of website businesses on the market, which is causing a drop in the average multiple. Potential buyers need to be sought after, by either using a broker or selling it in a private sale. Negotiation with your potential buyers including the price and full terms of the deal. Help the new buyer run your business, by training and giving insight to the company and the way it runs. Depending on the individual business and terms of the sale, will vary on how long it will take to sell your business. Generally speaking, the larger deals that are over the $1 million marker take longer to sell, than smaller companies that are under the $200 K mark mainly because of the complexity of the business as well as the risk to the buyer of the company. If your company falls under the micro business category, (under $50K), it is possible that it can be sold in a week or two when being sold on a marketplace like Flippa. 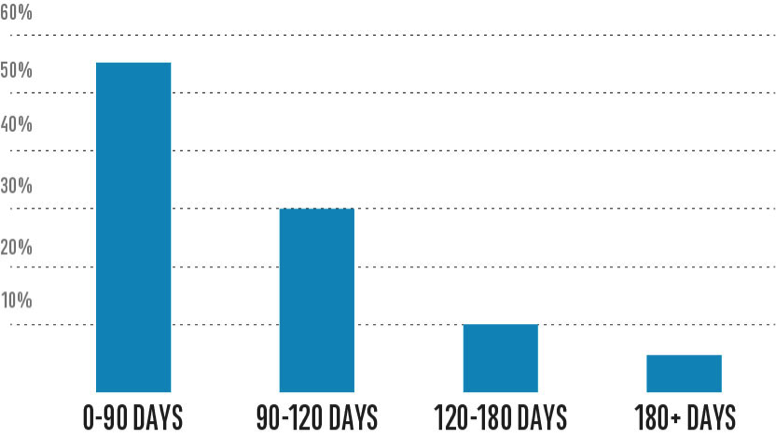 The graph below summarizes all the deals that we have completed and the time it took to finalize the sales on average. Over 50% of the deals closed within 90 days and within four months over 70% closed. Deciding to sell your online/website business can become a difficult and daunting decision for many entrepreneurs. And being able to put a price on a company that you have poured your heart and soul into is nothing to do light heartedly. Internet-based businesses are different than traditional businesses and, while they include e-commerce sites, they are much broader. For this, valuation methods used for determining the worth of an online business should go beyond those used for either of the other two. Automated tools, however, are inadequate, and the use of professional services is recommended.